Oliver, glorious Oliver! With one of the finest musical scores and some of the most colourful stage characters, Oliver is one of those musicals that I can’t help but enjoy. The familiar story of the orphaned workhouse boy has been brought to the stage this week by the Northampton Amateur Operatic Company. And if the busy theatre was anything to go by it is still one of those musicals that people just want to see. Although most of us in the audience probably knew it, the story is told well by the Company. From the opening Food Glorious Food, the story of Oliver comes to life and delivers great song after song that I could sing along to in my head. Oliver, played on Tuesday night by eight-year-old Will Miles, was everything the character should be and really tugs at the heart strings. There are also some strong performances from Nancy (Lisa Simpson) and Bill Sikes (Roy Taylor). But the real star was Fagin, played by Richard Walker, who truly captured the miserly crook. The cast was also backed up by a great live orchestra which really added to the atmosphere. With the well-delivered songs, strong scenes and those big characters, I couldn’t help but smile along to this old favourite. With economic doom and gloom raining down on ordinary families, seemingly without respite, it’s apt that Oliver! has returned to Northampton’s Derngate. After all, Charles Dickens knew a thing or two about the trials and tribulations of the working class. There’s not much to smile about at the moment. At least until the curtain raises on the Northampton Amateur Operatic Company’s joyous production of Lionel Bart’s adaptation of Oliver Twist and you’re treated to two and a half hours of wonderful escapism. My smile was as wide as the Thames. I’ve long thought Bart’s musical is three songs too long, but that takes nothing away from a joyous production by a local company we should all feel proud of. Richard Walker’s commanding portrayal of Fagin would be worth the walk to London to see it on a West End stage, while Lisa Simpson lights up the theatre as Nancy. For a boy of just eight, Will Miles is incredible in the lead role. But this is a magnificent team effort by a company, now 110 years old, which we are fortunate to have in our midst. Everyone plays their part – and every one of them deserves a huge pat on the back. Bravo! 27 years ago, I made my big stage debut at the ABC Cinema, Northampton in a production of Oliver! by the NAOC (or Amateurs as they are affectionately known) as one of the boys – and looking down the cast list, there are at least a couple of names from the 1981 production who are on stage again this week in this perennial family favourite. The TV Casting show ‘I’d Do Anything’ has clearly raised the profile of Oliver! and I thought I would send along a 9-year-old and his mum to see what they thought of this – knowing how much they have enjoyed seeing Jodie Prenger being cast as Nancy. Other than a few technical glitches with microphones and lighting cues (problems which can affect professional companies just as easily as amateur ones), all the feedback has been positive. They felt that the scenery and costumes were spot on for the period, the choreography worked well (particularly for the big ensemble numbers like Who Will Buy? and Consider Yourself). Inevitably their focus was on Oliver (played at this performance by Michael Kempster – sharing the role with Will Miles) and Nancy (Lisa Simpson). They were impressed by the way Oliver and Dodger built their relationship and found that the singing of Where is Love? and Oliver’s other big numbers was particularly sweet and affecting. They thought that Lisa Simpson shared many of the qualities of Samantha Banks (from I’d Do Anything) – a touching portrayal of the role with a rich, round voice and a great rapport with the boys. Given that Sam from IDA was a favourite of the Smith household, I count that as great praise! Overall, mother and son had a great night out at the theatre – supporting one of the longest standing amateur companies in the country. Groups such as NAOC are the cornerstone of our theatrical lives – many people first get a taste for performing or theatre-going because of the many dedicated non-professionals who give up their time to entertain us. Long may that tradition continue. 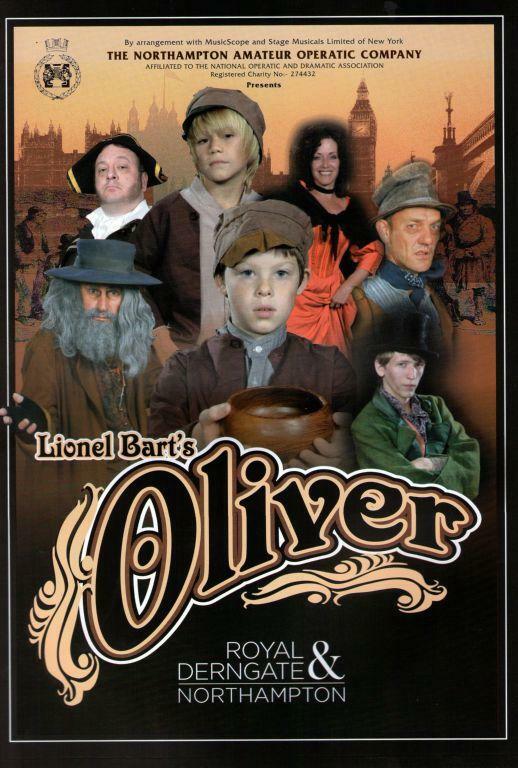 I’ve just arrived home from your performance of Oliver this evening (Wednesday 8th October). I felt compelled to congratulate you all on a wonderful performance. I try to go to the theatre as often as I can, but with a fairly heavy work schedule, this normally equates to 10-15 times a year. This is the first performance that has seen me come home and email those involved! I genuinely had a tear in my eye as the cast took their bows at the end of the performance. The young lad who played Oliver was fabulous – what a future he has if he continues in musical theatre. Nancy, Fagin, Dodger & Bet all produced fantastic performances. The whole cast appeared as one great and united team – an absolute joy to watch. Thank you for making my month.